Enter the world of fine bespoke suits, custom shirts and perfectly tailored gowns. Have you ever wanted a piece of apparel you can proudly call your own? Imagine the perfect attire made from the finest fabrics. One with a fit that seamlessly follows the contours of your body, accentuating your form and highlighting your best shape. 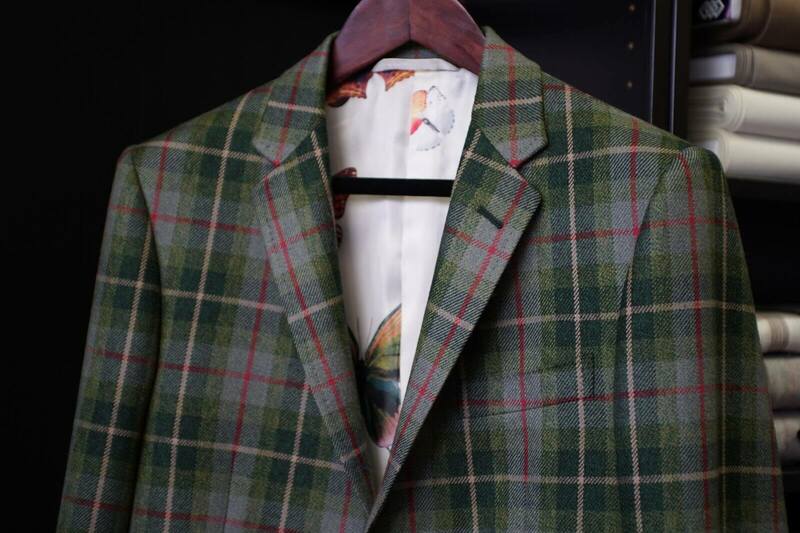 Crown Custom Clothing is a bespoke tailor providing custom clothing in Michigan. We provide suits, shirts, coats, jackets, and dresses for any occasion, from weddings to casual get-togethers. Since 2010, we have satisfied our customers with excellent service that is echoed by our 5-star Yelp and Google reviews. With the right fit, fabric, and design, you’ll leave with a statement piece you’ll be proud to wear for years to come. 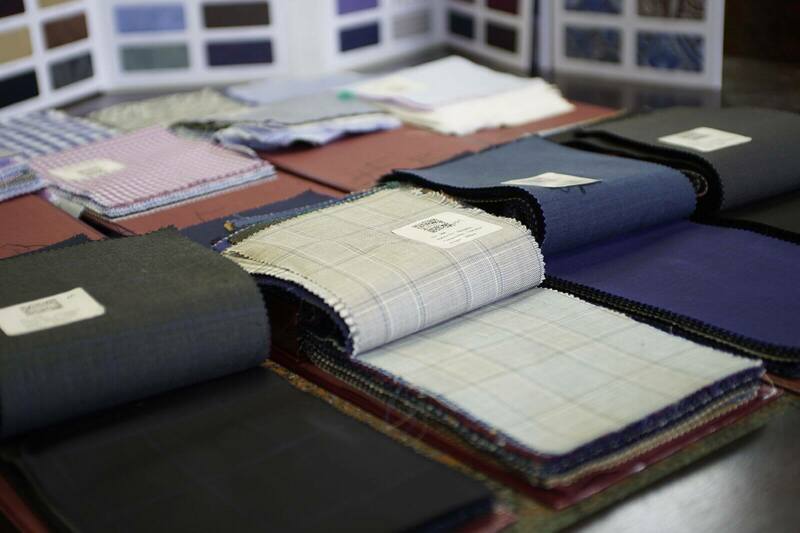 We offer the best wools and linens from Holland and Sherry, Huddersfield Cloth and Ermenegildo Zegna. If I ever need something tailored again, I am going to Mo. Not only is he a craftsmen, but he is truly an amazing person who will go above and beyond. It is not just about the money for him. He is equally rewarded when he sees how he has helped you and when you show how happy you are with the fit. That being said, he is very good at his job and he made my horribly fitted off-the-rack spaghetti-strapped bridesmaids dress that was too big for my bust, yet somehow fit my hips look great on me by reworking the middle section and molding it to my frame. Outstanding work that is technically difficult. He is a pro and you can trust his technical skill and expertise. I also called him on the day of the wedding in Chicago because none of the bridesmaids could figure out the eye-and-hook clasp on the back. He was patient with us over speakerphone on a Sunday walking us through the dresses' horrible design. Thank Mo. You are amazing. This is GREAT place to get clothing tailored. Mohammed is so nice, the prices are reasonable, and he was able to accommodate a quick turnaround on some alterations for me. I won't be going anywhere else! Mohammed is very a very kind and helpful man and his alteration services are reasonably priced. His shop is small but clean and he works quickly (I only gave him 4 days to tailor a ball gown COVERED in sequins and he did a great job!) I'd definitely recommend this place! I had a small rip in my skirt and went to Crown Custom Clothing for the very first time. The moment I entered the business, I was greeted by Mohammed. Noticing gorgeous fabric swatches on the work table and suits that you could never find at Somerset, I was doubting he would sew my $20 skirt. I was wrong. He treated me like I had asked him to create Cinderella's wedding dress and had it done in 1/2 an hour. I spoke to another customer while I was there and he showed me photos on his cell of the tux Mohommed made for his wedding… it was absolutely rich! Let me begin by saying that I have read review after review on all of the tailors in the Royal Oak and Birmingham area. There was something about the outstanding reviews of Crown Custom Clothing that drew me in. I decided to bring a bridesmaid dress here that was probably 2 1/2 sizes too big. The dress is strapless and had a mini train that I wanted cut to match the rest of the dress length. When we first got there, Mohammad wasn't there so I started to get nervous with the other worker. He was trying to pin the dress to fit me and it just wasn't working out. I could tell he was getting frustrated with pins popping out everywhere and it seemed that he didn't work much with dresses. He ended up calling Mohammad and put him on the phone with me. Mohammad said that he was on his way and would be there shortly to take care of everything. The minute he walked in the door I felt at ease. You could just tell he knew what he was doing. He also gave me a discount for waiting. I was already going to give him a yelp coupon, but it was a nice gesture anyway. He had my dress altered and steamed exactly 2 weeks later. I tried the dress on which fit PERFECTLY. It felt like a custom made dress and looked beautiful. He did a wonderful job. I also wanted to comment on how friendly Mohammad was. I brought my husband and 3 year old son both times and he engaged my son both days. That obviously had nothing to do with his craftmanship but it always makes for a more pleasant experience when people are happy and friendly. I would definitely recommend this business. I can't speak for how he tailors custom suits but I do plan on taking my husband back there for a custom suit in the future. I highly recommend Mohammad and will take my business there again. While any tailor can hem pants and shorten sleeves, Crown is where you go to have a suit tailored to fit and look the best. Reasonable prices, amazing skill, accurate turnaround times, and honest advice that I have not found in other local tailors can all be found at Crown. My first experience with Crown was to review another tailor’s alterations which seemed off to me. He immediately identified the issues, and others, and was beyond reasonable in his price and turnaround time. After receiving the finished product, it was night and day – I was shocked to see what a skilled tailor could really do after years of not knowing any better – and I wear a suit every day of the work week. 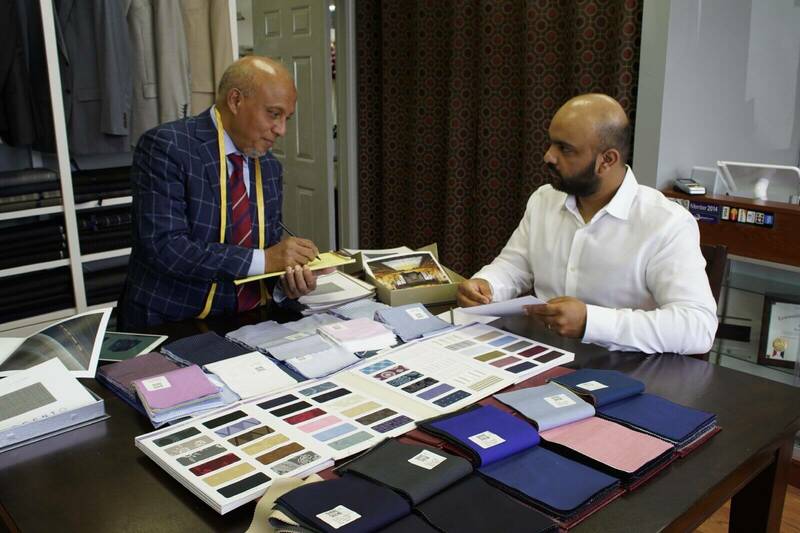 Considering that he makes custom suits, Mohammed’s experience in that area is above and beyond others that I have gone to in the past. Crown is now my go-to tailor for all of my suits, most of which are made to measure. Mohammed takes something that is better than off the rack and makes it amazing every time. He has even taken time to plan out my first custom suit even though it is likely months away. Go to Mohammed – you won’t be disappointed. Mohammad did a great job with my custom suit. Highly recommended!!! Professional Service. High Quality. Amazing style. Mohammed made me a beautiful bespoke tuxedo for my brother’s wedding in the Philippines. I customized it with him down to the fabric, lapel, buttons, pockets, and monograms. I was amazed at how wonderful it turned out. Mohammed is definitely an artist and takes great pride in his work, sizing me up to the exact fit. He did this all in timely fashion and is a gentleman. I highly recommend his services for custom made suits and tuxes! I always go here when I need something tailored. The shop always does fantastic, original work. Recently, I sent in my grandmother’s vintage silk dress with rips, and a pleated skirt that was a size too large. Both came back perfectly and meticulously tailored. The service and work is outstanding! Mohammad is very professional in his services. He had provided an excellent stitching service for all my clothing needs. He is very meticulous in his work and provide discounts for his regular customers. He will make sure that you are satisfied with the service and will quickly accommodate any urgent requests. His expertise includes: Custom fitting of Suits, Blazers, Shirts, Tuxedos, Top Coats and alternation of any kind. He has a charming personality which makes his services unique and keeps his customers returning back. Mo was wonderful.. he altered my dress for my daughter’s wedding and did a great job. He had to do a lot of modifications on the top to make it fit correctly and I was impressed with his attention to detail. I wasn’t sure of where to go for a few shirt alterations of shirts I got from the store that were a little too big. I looked around online and Crown was on the way from work so I decided to drop in and get my shirts done. The gentleman there was great, efficient and super knowledgeable, my shirts were no rush and got the fixes done in less than a week, and after sizing initially he had me try them on and did some last minute alterations all within the 15 minutes I stopped in to pick them up. Great quality here! I’ll be back for sure!